We had a fantastic and not so fantastic hunting season this past fall 2018. 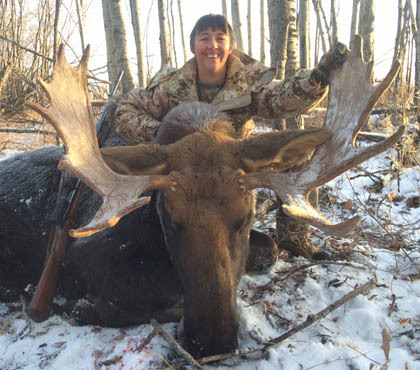 Our moose hunts were the highlight of the year with 100% kill success on the rifle moose, 22 bulls for 22 hunters and another 4 bulls were taken for the archery moose guys and 2 more moose were bowkilled by guides Josh and Gerard. 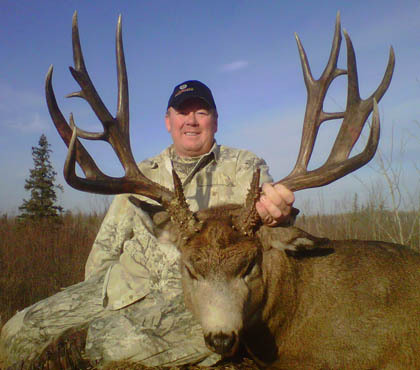 Our archery elk hunts were also really good with lots of bugling action and 3 out of 4 hunters shooting elk. 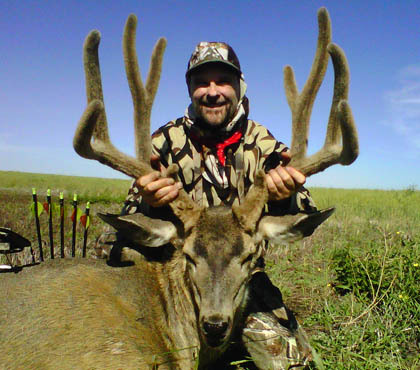 The mule deer bowhunts were also great with daily stalks on Poper bucks and three big 180 plus score deer being killed. We just finished up another awesome bear season! We had 30 hunters who shot 34 bears, 4 minor flesh wounds and 30 kills. 25 of the 30 bears were good size male bears and 22 of them were big boars that went over Pope and Young's 18 inch minimum skull score. 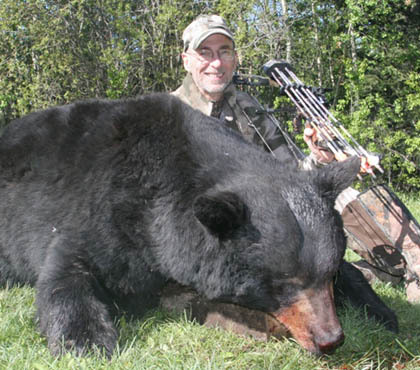 12 of those 22 bears also went over 19 inches, 3 went over 20 and one was way over the Boone and Crockett minimum of 21. We weigh all of our bears and 12 of them also broke the 300 lb mark, which is big for a Western Canadian spring bear, 4 bears broke the 350 lb mark, 2 over 400. Of course none of these statistics tell the stories of how much fun everyone has on this hunt. Our solid, wooden ground blinds give a close up experience like none other, especially with the large numbers of bears on our baits. We feed at least 400 different ones on our 30 sites and hunters often see 15-20 bears in an evening's hunt. Some hunters have no idea how many they saw just that it was a steady stream of bears in and out all evening, very exciting! Despite some tough conditions, we had another fantastic bowhunting season, Aug 25th to Sept 14th! Once again this was due to our incredible guide crew, Kyle, Josh, Gerard and Cody and a bunch of great hunters!! We hosted 14 hunters who fired off a couple dozen arrows and ended up killing 11 animals. We had good hunting weather on the first week of the season and then on September 1st it turned cold with endless rain making the hunting very tough but we persevered. What a fantastic bowhunting season we had, our best ever! This was mainly due to my incredible guide crew, but also good weather conditions and really great hunters who came prepared, in shape and ready to shoot!! Our mule deer have made a really good comeback, three mild winters in a row along with good spring moisture has made a huge difference in antler growth, body size and deer numbers. 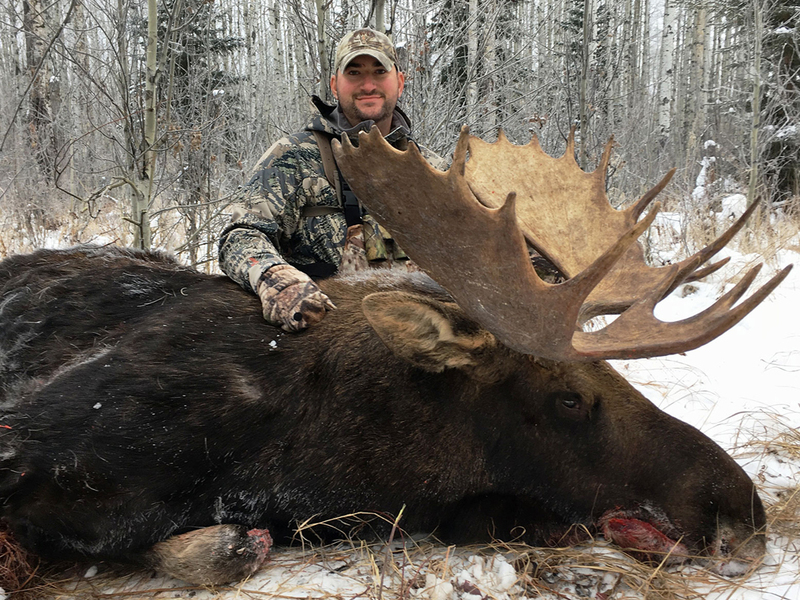 Our elk population continues to grow too even with unrelenting resident hunter pressure and the moose are doing really well with the limited draw on them for rifle hunters. Along with the healthy Whitetail population, tons of Bears, some Wolves and Cougars our area continues to be a Big Game Hunter's Paradise. What an absolutely fantastic Spring Bear Hunting season we had! Big bear after big bear came rolling into camp every single week of the season. Just when we thought we wouldn't get a another giant, some lucky hunter would get another monster. I've never seen it like this before and this was with the earliest spring in the last thirty years, with hot April and early May temperatures, not normally good for bear hunting. 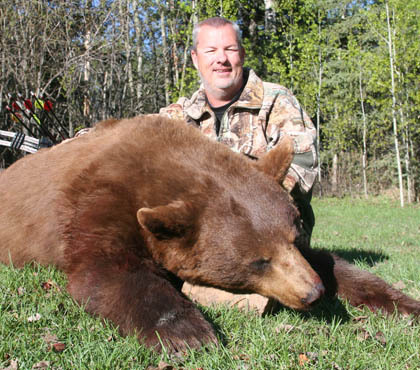 We hosted 30 hunters who shot 28 mature bears, all with hides well over 6 foot. 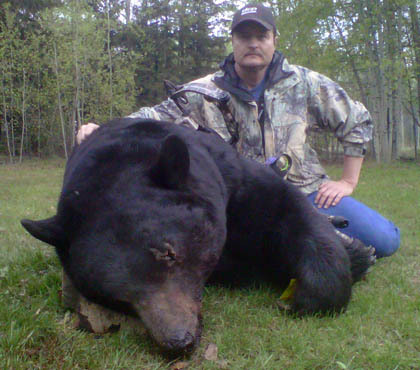 Everyone saw lots of bears and only one trophy hunting person didn't shoot a bear. Our bowhunting season Aug 25 to Sept 14 was a great success, although with bowhunting it is much tougher to get that 100% kill success. We are almost always at 100% opportunity. We were very close to that this past bow season even though we had rainy, windy and cool weather almost the whole time. The mule deer wouldn't bed in the muddy fields for spot and stalk hunting, the moose wouldn't come into the natural salt licks and the gusty winds messed with the elk bugling. Very challenging conditions. Fortunately we had some good hunters along with talented bowhunting guides who worked hard to get it done no matter what. Fall 2016 was another great year of hunting for us at Mike's Outfitting Ltd! But it certainly had its challenges, mainly continuous wet weather! We had never seen anything like it. In our country, rain means mud and sometimes we felt like we were trapped in an endless sea of it. The animals don't like being out in the muddy fields where we do a lot of our hunting and the roads were a rutted up mess, wrecking trucks and quads as fast as we could fix them. We tried to take it all in stride and do our best to give good hunts and we did take some great animals. Hopefully our hunters felt that we also gave 100% effort. I know everyone at least enjoyed the delicious meals created by our cook, Ana Terhorst! 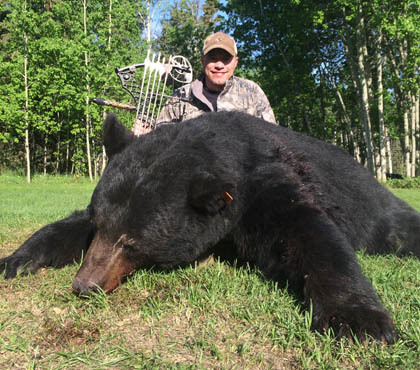 We had another very successful spring bear hunt in 2015! 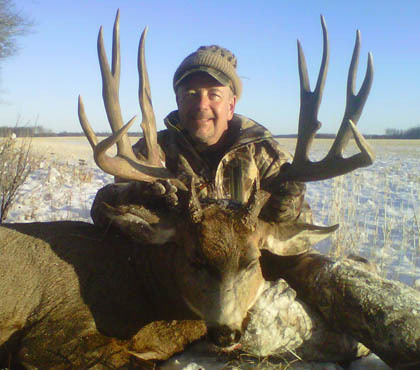 Clint Morrow from Colorado was another repeat hunter and one of the luckiest hunters of the season. He was sitting the Gravel Pit bait when the Legendary and Ghostly Eartag Bear came strolling in, hot on the heels of a sow. We have been trying to kill this bear for 4 years! 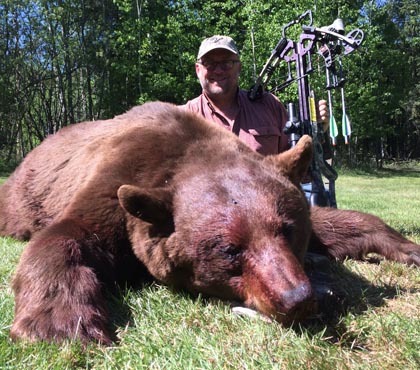 Clint took him down with one well placed arrow, 21 2/16 skull and 360 lbs, an awesome bear!! We had a very good fall 2015 bowhunting season! 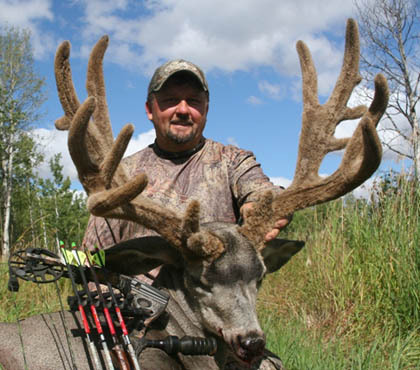 We hosted 13 bowhunters who shot 5 mule deer, 2 elk, 2 moose, and had several shot opportunities. Everyone had a great time, lots of laughs and all the hunters threatened to do a return trip in the future! 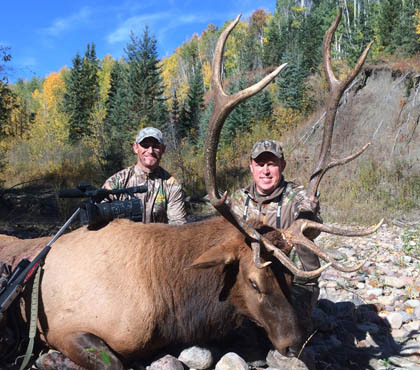 Chad Boyd from Colorado with super guide Kyle Mudge, whacked an absolute giant 205 inch beast of a deer! 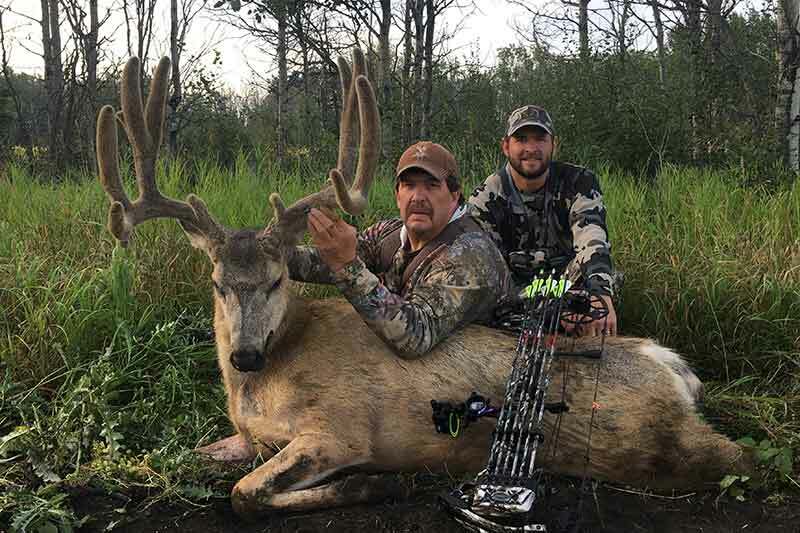 Chad is probably still smiling about that buck. 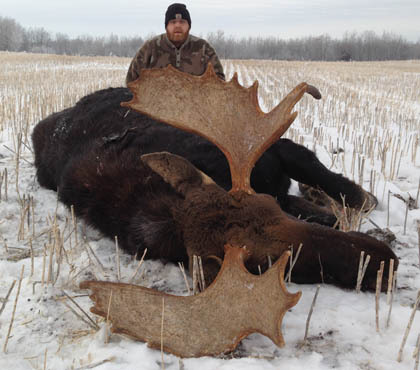 We had 100% kill success on our whitetail deer rifle hunts, early season moose bowhunts, and rifle moose hunts. 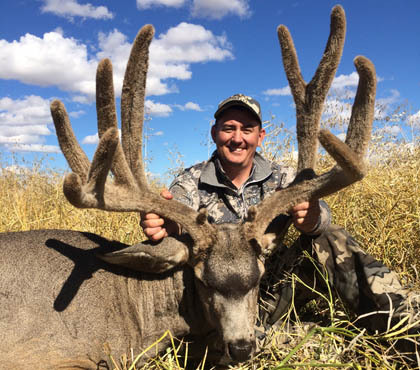 100% opportunity rate on our mule deer rifle hunts with an 83% kill success. 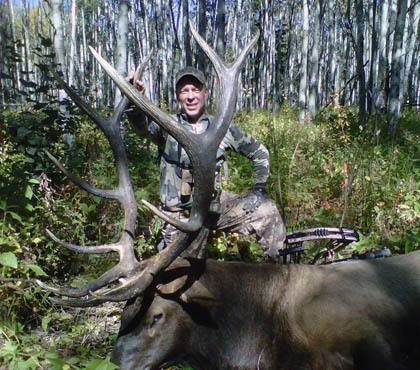 83% of our rifle elk hunters also shot bull elk. All of our hunters also seem to enjoy our comfortable lodge. Having an incredible guiding area with six big game species doesn't hurt either. We had an excellent bowhunting season! There were more giant mule deer around than we have seen in several years, lots of twin and even triplet deer fawns and high numbers of moose and elk. It was really great to see the animal numbers coming back so strong! With the late green up the number of shooter boars on our trail cameras at the start of the season was amazing, better than any of the previous years. 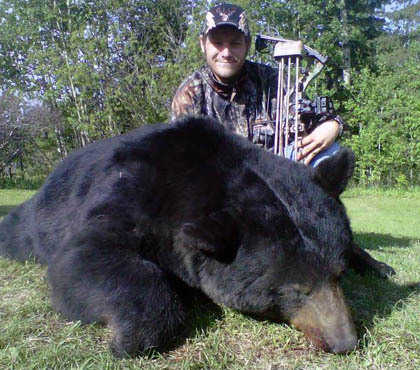 The huge Peace River valley continually funnels new large, roaming bears right to our baits. 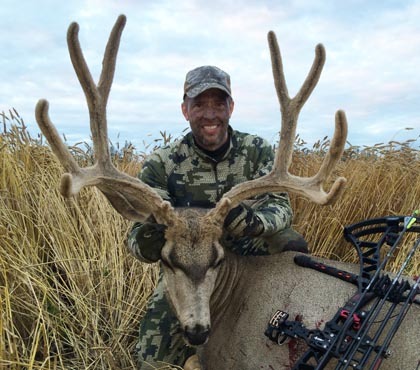 The kills on the mule deer bowhunts were really fantastic! We had 8 mule deer bowhunters who shot 6 bucks. 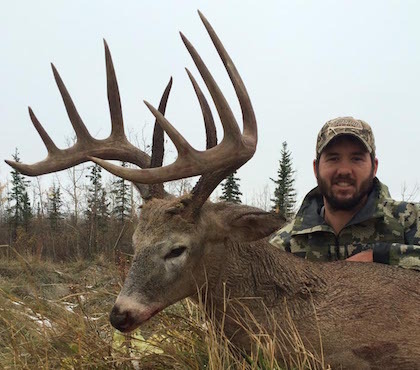 Brandon Hiatt from Colorado with a 206 gross score non typical. A miss and then a bit of a long shot took down his deer. This past 2013 fall hunting season was very successful but certainly had its highs and lows. We busted our butts though, so did all of our hunters and the vast majority of them seemed to go home very happy, wanting to come back again. 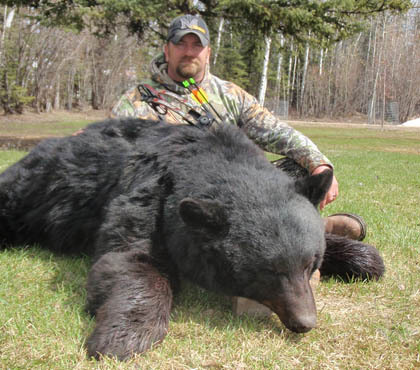 We had another incredible year on our spring black bear hunts! With our 2 bear limit we had 28 hunters shoot 44 bears. The number of shooter boars on our trail cameras at the start of the season was amazing, and as we shot them more seemed to show up. We had another very successful 3 week bowhunting season. We hosted 13 avid bowhunters who all had a great time and would love to return for another hunt. Our success rate was very good, especially for shot opportunities which were close to 100% for all the species. 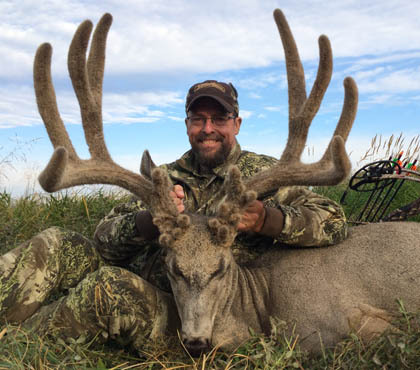 Our area really is a Big Game Hunter’s Paradise which allows us to consistently provide high success rate rifle and bow hunts for mule deer, whitetails, moose and elk. This year, our summer scouting revealed no winter kill and good antler growth. With our 2 bear limit some hunters got 2 big ones. Overall 34 bears were shot by 26 hunters. Clint Proctor from Utah shot a gigantic 445 lb, 7 ft 9 in, 21 12/16 boar on camera. It was awesome because I got the privilege of being the cameraman filming the biggest skull bear we have ever taken! Fall 2011 is in the history books and it was another great season, even though we did have some highs and lows. One of the highs was finally getting some great spring and summer moisture, the first time in 6 years. This usually creates maximum antler and body growth. We really do appreciate all of the hunters that held out for the good boars and didn’t shoot the breeding age sows. This keeps our area good year after year. Everybody could have shot 2 bears of some kind but with our selective hunting we had 26 hunters shoot 29 bears. The challenging conditions (drought) makes us better hunters though and forces us to learn every inch of our territory in search of good animals. 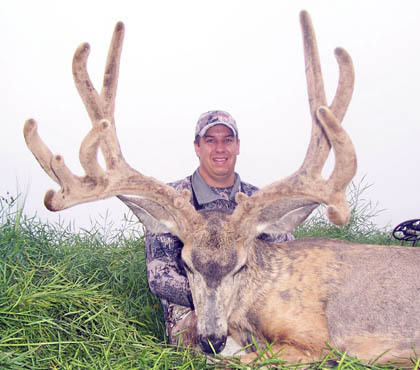 Troy took one of them, an incredible 207 non typical! A 191 typical frame with 16 inches of extras and 7 inch gnarly, bases. 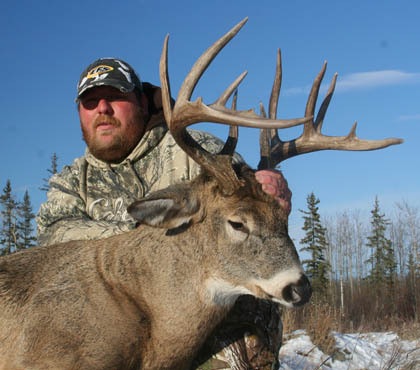 2010 was our 19th year of outfitting and our 5th fall season exclusively in the Peace River region. We killed 2 of our biggest mule deer ever, did great on killing moose, experienced some awesome elk bugling action and learned that we can still do well in a drought year.